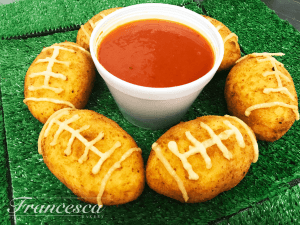 Italian pastries made fresh here at Francesca Bakery. We have a wide selection of beautiful, hand crafted pastries in our store available all day, every day. 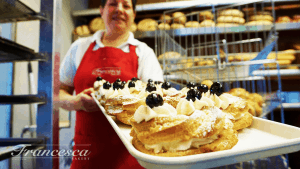 From Cannoli to Zeppole and Tiramisu to Butter Tarts. Always lots of fresh product in our pastry display case. Our pastry chefs are busy everyday keeping our fresh stock of Italian and European pastries fresh and plentiful. Normally we sell these by the single, half dozen or full dozen, but you can mix and match varieties to help please everyone in your group. We normally have dozens of different varieties in our pastry case, so there is definitely something here for everyone. 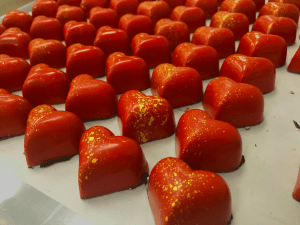 We would also like to point out that we use high quality, often imported ingredients alongside fresh fruits from local suppliers and hope that you can taste the difference in our quality pastry selection. 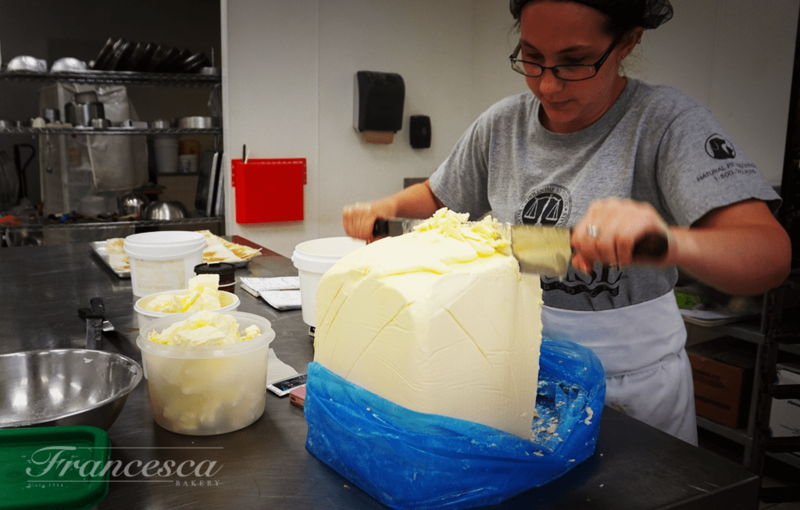 Candace cutting into one of our butter blocks for use in puff pastry. Butter makes it better. That is not just an axiom around here – it’s the truth! The flavour is unmistakable and adds a quality that is unmatched with any other fat. We use it here because we believe in tradition and quality in our products and we want you to experience that when you take that very first bite of something in the store. Have a large group or meeting that needs some awesome pastries? Check out our catering menu, as many of our in store pastries are available in bulk.